Thrift-ola eBay Sale is ON! My favourite item in the whole of the sale has to be this vintage Babycham wall light. It had pride of place on the wall in my shop Superette for many years and then in my bedroom. It no longer fits the decor of my place so I’m reluctantly letting it go to a loving new home. 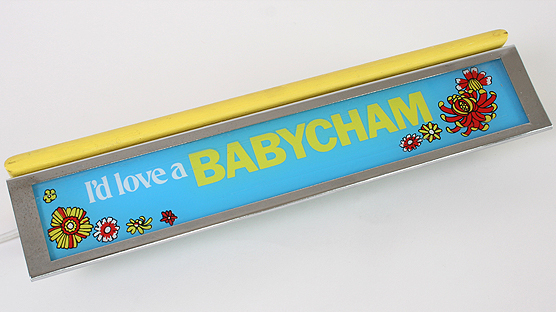 There’s also a giant Babycham bottle moneybox in the sale. I love pineapples and this has to be my favourite ever shade of pink… makes me think of lazy hazy days in a 50s Palm Springs paradise. The top part of the pot pops off so you can store stuff inside, I think cotton balls would fit just perfectly. It’s made by a company called Giftique in New York in 1975. 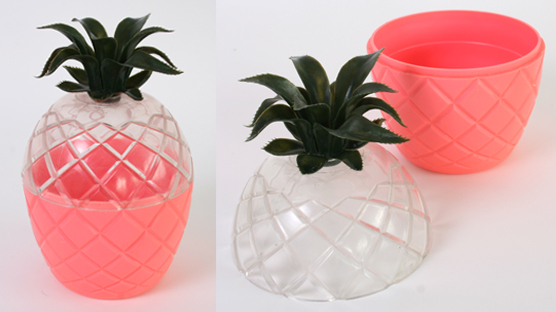 Bid on the Palm Spring Pink Pineapple Pot here. 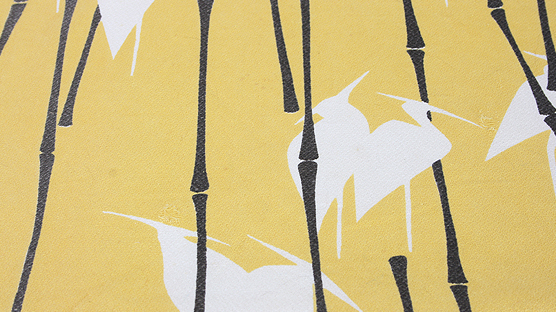 A truly stunning pair of vintage curtains for a 1950s loving home. Check them out styled for a photoshoot here and used as a backdrop for one of writer Carrie MacLennan’s profile pics here. They are made from a quality crepe style fabric and each curtain measures 169cm wide with a drop of 203cm. Bid here. 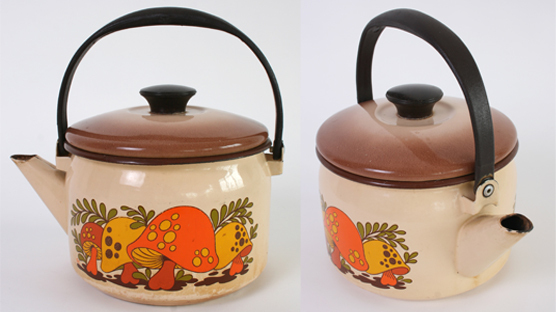 This style of toadstool illustration is my fave motif of the 70s and the montage on this enamel kettle in Autumnal shades of orange, olive and mustard is completely classic. If I was a camper I’d keep this kettle in a heartbeat, although I’m half tempted to just have it as a display item in my kitchen. Oh well, too late now. Bid on the toadstool enamel kettle here. Keep by the sofa, at the end of the bed, in the car or wherever those chills might creep in and this beautiful vintage wool blanket will be just what you need to snuggle up to. Also makes a lovely throw to jazz up a simple sofa. 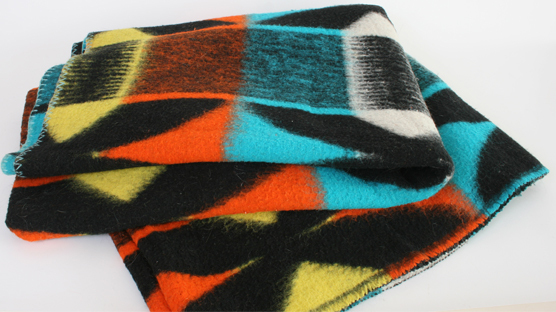 Vintage wool blanket in stunning shades of turquoise, orange and yellow with wonderful black and white pattern measures 160cm by 202cm. Has a lovely giant sky blue blanket stitch on both ends too which is just the perfect finishing detail. Bid here. I’m always in a quandary what to do with amazing vintage tea towels because using them to dry the dishes just doesn’t feel right. On a recent trip to Kempton Antiques market I spotted a trader upcycling them into wall hangings simply by stretching them out onto canvases with wooden frames. Such a neat idea and definitely what I hope the winning bidder will do with this super cute lion and mouse linen tea towel made by St Michael. 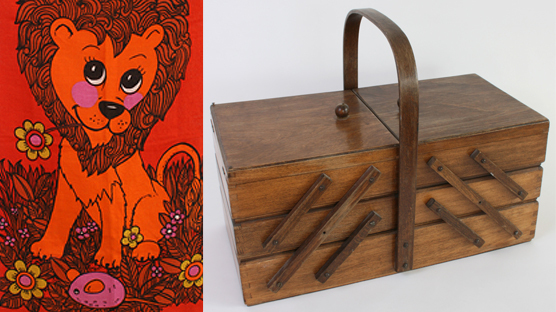 Every vintage ‘n crafty loving home should have a traditional wooden cantilever sewing box and this one is huge so you can store so much stuff and it looks beautiful. Being a vintage fanatic that loves a homespun look my own personal crafting skills let me down big time. Even more so since I dislocated my finger but that’s a whole other story! 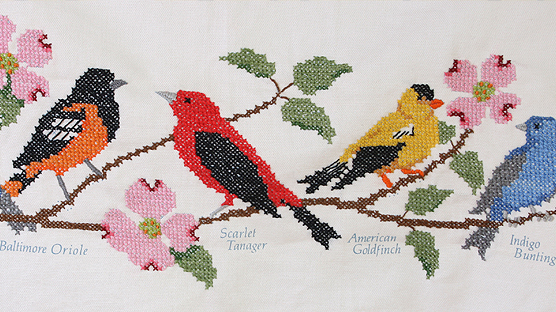 So I love to thrift a vintage homemade craft project and here we have a carefully stitched branch of birdie pals on a soft piece of cotton. In my wildest craft dreams I would turn this pretty piece of fabric into the cutest cushion. My skill set is waaay below this task so it’s over to you clever sewing folk, you can bid here. As I write this post the blazing sun is streaming through my studio windows and Victoria park is calling my name. How I’d love to throw a bottle of pimms and a baguette into this basket and head out into the sunshine! 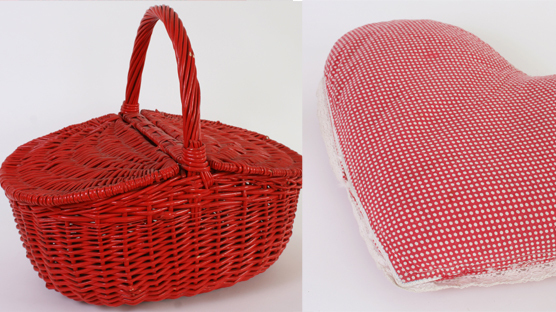 I’ve never actually seen a red wicker picnic basket like this before, isn’t it ace and in such good condition. My top tip for picnic baskets in the winter is to use them as storage containers! I have a couple sat on top of my kitchen dresser which hold all of my baking tins and measuring devices. Hearts and polka dots your thing? This cotton heart shaped cushion is just for you. Swoon. 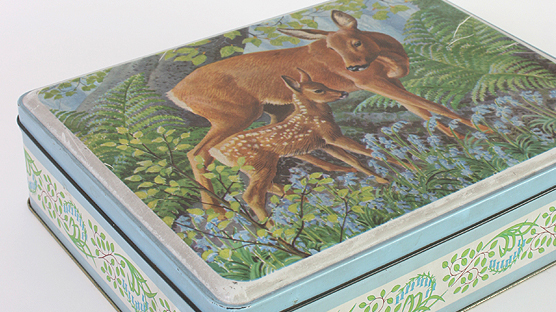 Fawns and vintage tins; another heart melting double act according to the thrifting gospel in Thrift-ola Towers. This is a real beauty, created for Christmas 1959 by Frears Limited, Woodgate Leicester who were English biscuit manufacturers. Bid here. Check out all 148 items in the vintage Thrift-ola sale HERE! All auctions end this Sunday 29th July between 5pm and midnight. Happy bidding y’all! One Response to Thrift-ola eBay Sale is ON!